The front cover is typical of music magazines of the hip-hop genre, but this conventional design is still effective. The masthead is at the top of the cover, it goes across the full width of it and is the largest text on it, as it is very important that it is immediately obvious to the reader what magazine it is they are looking at. Although this design is mostly conventional, there is individuality in the masthead as the word ‘connection’ is cut out of the last letter ‘P’ which gives the magazine an air of exclusivity and uniqueness. 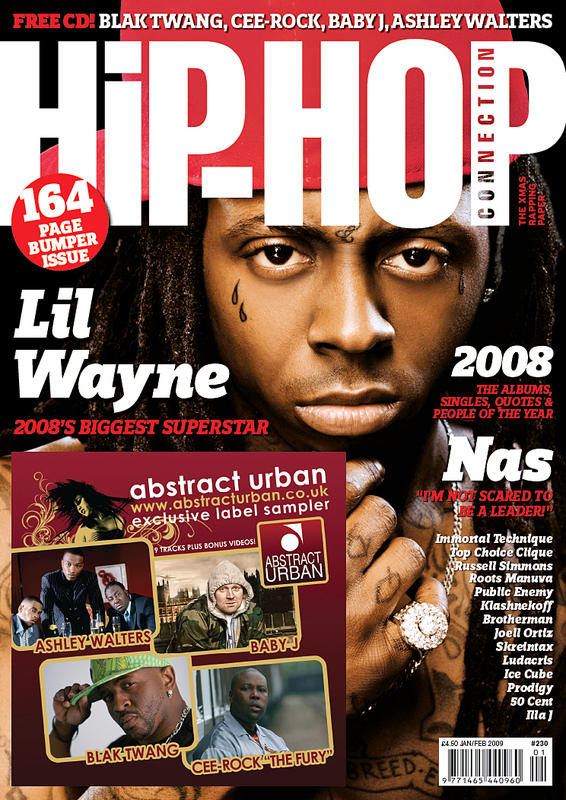 Even though the medium close-up of ‘Lil Wayne’ takes up the majority of the cover, they have superimposed the masthead over the top of it, further accentuating the importance of the brand name and making sure it is visually apparent to the reader what the name of the magazine is, ‘Hip-Hop Connection’. The masthead is in bold and is a sans-serif font, this links in with the whole idea of masculinity which is ever present in the whole genre of hip-hop. The font used for the masthead is white, and this works really well as it is a complete contrast from the background colours and this helps it to stand out even more. On the bottom left of the masthead, over the top of it is a circle with the words, ‘164 page bumper issue’ inside it, this is instantly noticeable when you look at the cover and is useful in highlighting to the reader that this copy of ‘Hip-Hop Connection’ is a very important one, thus increasing the chances of it being bought. Above the masthead is a strapline which says ‘Free CD! Blak Twang, Cee-Rock, Baby J, Ashley Walters’, this helps draw the reader’s attention to the free CD which is being given away with this issue. The exclamatory nature of the strapline is another technique used which helps to emphasize the free CD on offer. A free CD is offered with the magazine as it is hoped that this will entice the reader into purchasing the magazine, the artists that are included on the CD are also gaining publicity by the magazine doing this. The artists that are featured on the CD have their pictures on the pack the CD comes in and their names below their pictures, it is conventional that the magazine features the artists from the CD on the cover and when this issue of the magazine was available for sale, their pictures would have been visible on the pack the CD was in, which would be attached to the cover. This is an example of how the music industry and the media industry mutually support one another. 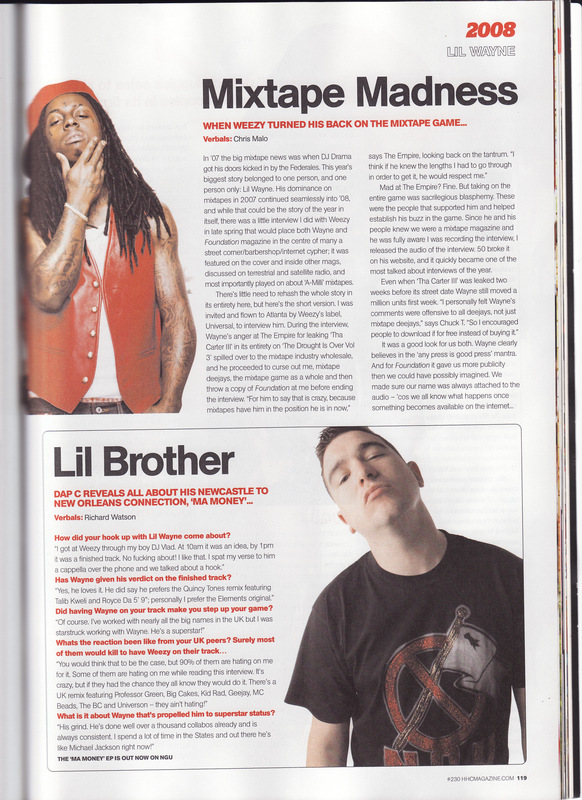 On the left-hand side of the picture is a heading with the name of the artist, in this case it is ‘Lil Wayne’, this is written in a smaller font than the masthead but is in the same colour as it, white. It is a serif font as is all of the other text on the cover; this alteration of font type helps to separate the actual content of the magazine, and the magazine name itself. There are two other headings on the cover, both of a smaller font than this one but all with the same font and font colour. The size of the headings differs for all three and the biggest is the one that is most likely to interest the reader, with the smallest being what the magazine perceives to be the least interesting to the reader. Below all three headlines is a cover line in a red, serif font. This gives the reader a brief overview of what the articles advertised are about, making them want to open the magazine and see what the articles are. Furthermore, along the right-hand side of the cover in small, white, serif fonts are the names of other artists that are featured inside the magazine so if the artists that have the bigger advertisements do not interest the reader, then he/she can look through this listing of the other artists and find some that they do actually have an interest in. The choice of image used on the cover of a music magazine is always vital as this is what attracts potential readers and it also defines the genre of that music magazine. The person featured on the front of this issue of ‘Hip-Hop Connection’ is ‘Lil Wayne’ and when people see him on the cover, they will instantly associate the magazine with the hip-hop genre as this is the type of music he produces. Having him on the front works as a magnet and attracts fans of the hip-hop genre to purchase this magazine. The majority of people that read ‘Hip-Hop Connection’ are in the 17-29, male bracket and the brand values of the magazine are described as ‘uncompromising, exclusive, gritty, street, controversial, urban, accessible and unique’. All of this information is from their media pack and we can therefore see how the magazine targets their core audience through how the magazines brand values are expressed. 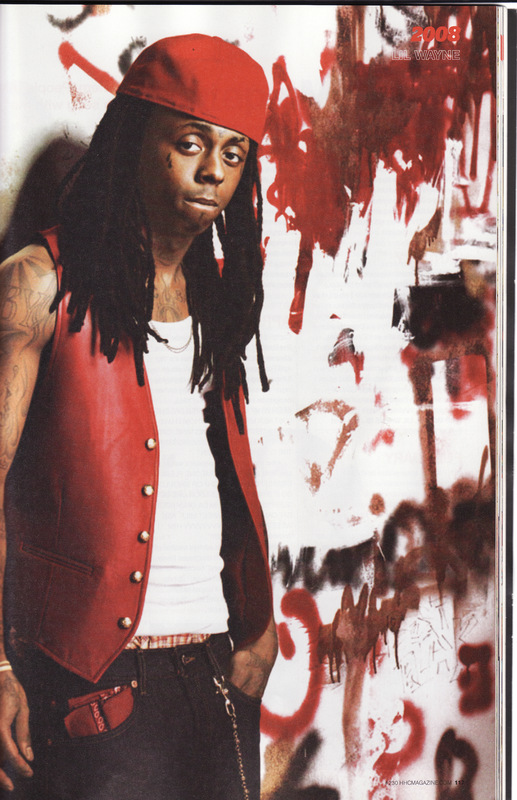 The picture of ‘Lil Wayne’ shows him glaring at the camera with his hand on his chin, which makes the expensive, diamond ring on his little finger visible. The lighting is coming from one side of the photo so one side of his face is lighter than the other, which causes a shadow effect and makes the photo even more effective in portraying the aggressive, intimidating expression that the artist is trying to give off. Additionally, the lighting also helps make the many tattoos ‘Lil Wayne’ has very obvious, and this all links in and further accentuates the image of a violent, threatening character. The photo is in the centre of the cover and all of the writing apart from the masthead is placed around the photo, giving the photo a degree of importance, with the only thing more important than this is the masthead which obviously displays the name of the magazine to the reader. The house style of the magazine is a very important aspect as it is this that helps the reader distinguish between this magazine and other, very similar ones around it. The choice of the fonts, the colours and the layout of the magazine are very and it is very evident what the house style of ‘Hip-Hop Connection’ is. There are only three colours used on the cover, black, white and red and this stays the same throughout the rest of the magazine, this helps to create uniformity and define the house style of the magazine. The main colour used on the cover is black and this links in with the genre, as it can represent violence due to the connotations associated with it. The cover follows many of the conventions of the hip-hop genre but it is still very effective and this is largely down to the house style the magazine has managed to form and consistently kept throughout. This cover will help to influence me in the design of my own music magazine as it has made me realise how important the house style is and also how different, subtle techniques such as what choice of font to use can add to the impression I am trying to portray to the reader. The purpose of the contents page is to inform the reader of the different sections of the magazine and to make it easy to find the specific parts that they wish to read about. We do not read a magazine like a book and therefore will not read everything in the magazine, so it is a necessity that the contents page makes it easy for the reader to find certain articles that he/she is interested in, and so that they do not have to read through the entire magazine to eventually find what they are looking for. All the headings are uniform in the font used with them being bold and black, with the page number that the article is on being before the heading of the article and of the exact same design apart from the colour used, which is red. 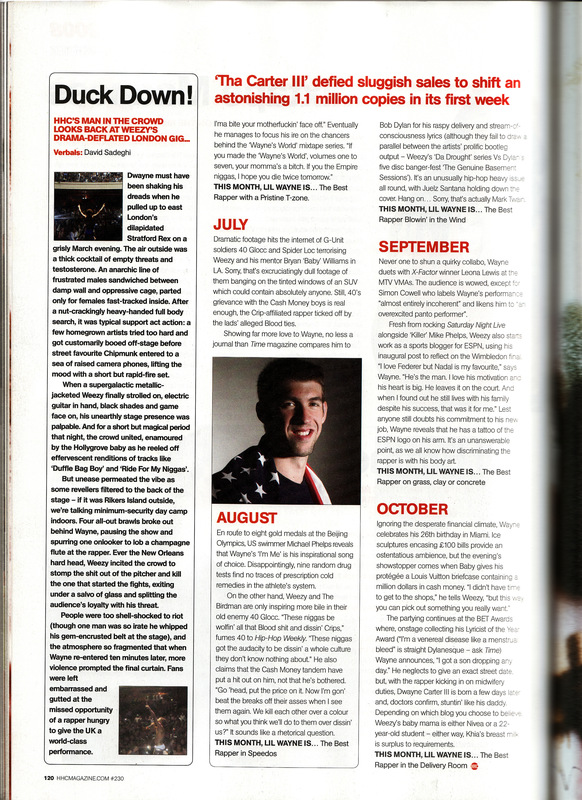 Below each of these headings is a short summary of the article which is in a smaller sized font, all of the fonts used through the whole of the magazine are sans-serif, which adds to the impact of the font on the page, making it bolder and to stand out more further fuelling the masculinity of the magazine. The choice of the sans-serif font is an effective one and so is the contrast of the size of the writing on the page, for example the ‘features’ heading is a large font and very bold, the sub-headings below it are still bold but are smaller, and the summaries underneath these sub-headings are not bold at all and are quite small. This makes the magazine aesthetically pleasing and very easy for the reader to take in all of the information on the page and find what he/she is looking for. The only exception to the size of the font and the positioning of the text is that which is below the photograph. Here the page number is the largest sized font on the whole of the contents page and instead of being on the right-hand side of the sub-heading, which is also larger than the other sub-headings on the page, it is above it, which makes it stand out from the page and undoubtedly captures the reader’s attention. Colloquial language is often associated with hip-hop and this magazine follows that convention. In order to communicate with its readers more effectively the magazine is written very informally as this is the sort of dialect the target audience is used to and adheres to. For example, under the sub-heading ‘love & crime’ it says: ‘this year’s love lockdowns and brushes with the po-po’. This all fits in with the house-style of the magazine, it is very urban, street talk and is an example of them understanding who they are trying to get to buy their magazine and trying to successfully communicate with them. The colour scheme used throughout this issue of ‘Hip-Hop Connection’ is one that is a mixture of black, white and red; this is because these colours are masculine colours and link in with the genre of the magazine, the hip-hop style where appearing intimidating and macho is the norm. On the contents page along the right hand-side of the page are all of the different articles under a ‘features’ heading, they are not split up into interviews, music reviews etc. This heading is in large, block, capital letters and instantly draws the reader’s attention as it is supposed to, as below the content of the magazine is listed which is obviously very important. 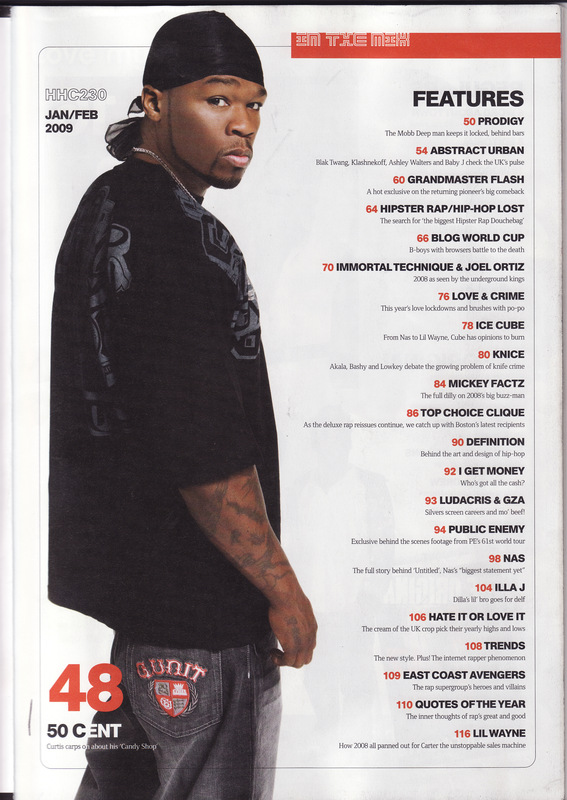 On the left hand-side is a picture of ’50 Cent’, it is the length of the entire page and is a medium-long shot, he is facing away from the camera and is looking over his shoulder and the tattoos on his arms are visible. His pose is conventional of a Hip-Hop magazine, with him looking threatening and as he is a well known rap artist this is likely to draw in many readers and boost sales of that magazine. Furthermore, this contents page indicates that the reader’s are interested in the well-known, mainstream artists as all of the sub-headings are relating to this type of persona. For example, ’50 Cent’ is one of the most renowned artists in this genre and this is reflected in the main featured article being about him and coupled with that, a photo of him taking up the whole length of the page. 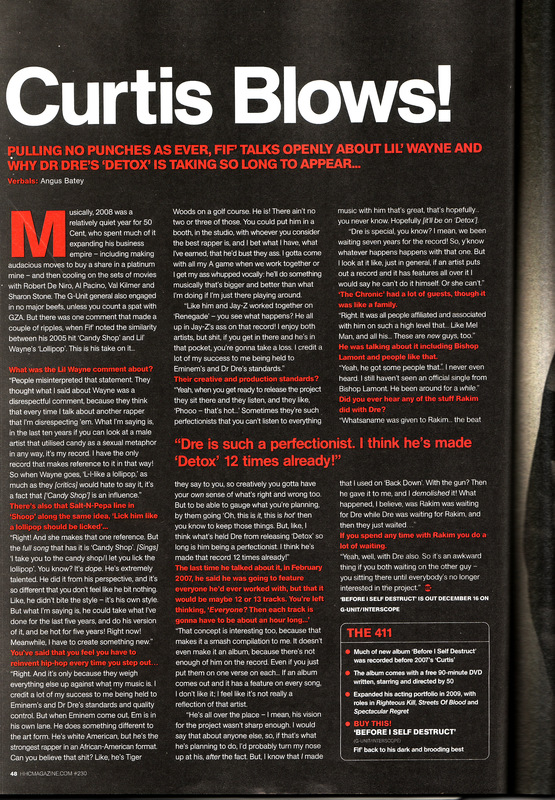 The middle page spread is usually of the artist that appears on the front cover of the magazine, so in this case it would be of ‘Lil Wayne’, and there is an article on him in the magazine which is in fact the longest article of all consisting of six pages. 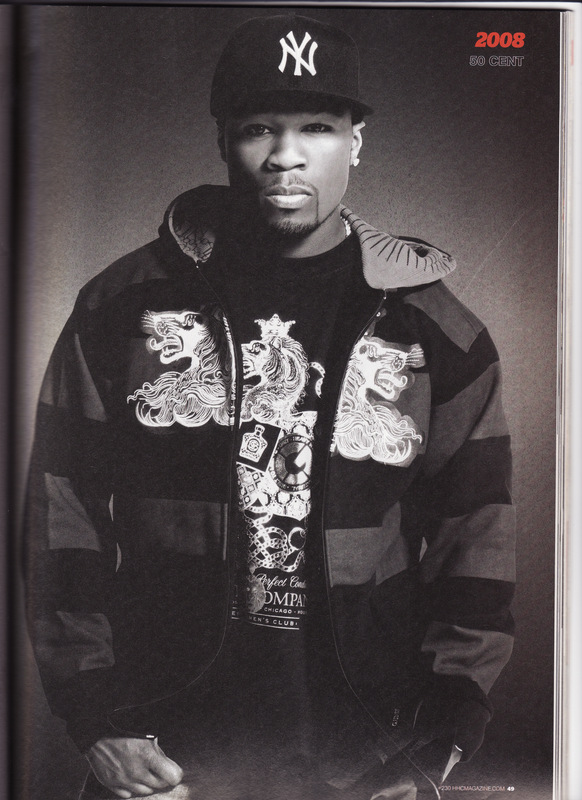 However, I have decided to analyse the one of ’50 Cent’ which is shown on the contents page and is made to stand out the most out of all of them, this is because I feel it provides a better analysis and it only takes up two pages, unlike the other which takes up six. The fonts used are the same as the ones used on the contents page and also throughout the whole magazine, they are all sans-serif fonts. The heading is again very large and very bold so that the reader’s attention is drawn to the article as soon as they turn to it. Below the main heading, the strapline is a bold, smaller sized font and below this, the article is written in an even smaller font and this isn’t bold. This layout is consistent with the contents page and is an exact replica of the style seen previously, the magazine has used this style throughout and it is very effective. There is a large first letter in the article and there is also a quotation which acts as a lure to the reader cutting through the middle of it, both of these effects help to break up the text and make it appear like there is less writing than there actually is, which is another attempt at drawing the reader in. As there has been earlier on in the magazine, and as is common with the genre, there is the use of colloquial language which helps the reader engage with what he/she is reading. For example, in the first paragraph it says: ‘the G-Unit general also engaged in no major beefs’. Again this helps the reader to relate to the content of the article and creates a consistency throughout the magazine which increases the effectiveness of it. 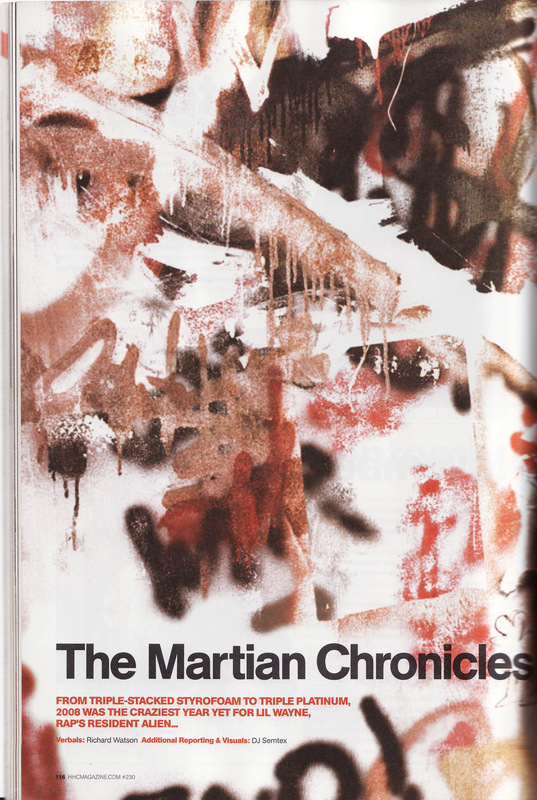 The colour scheme used for this middle page spread uses the same three colours that were evident earlier on in the magazine, black, white and red. However, there has been a variation in what colour the background is for this middle page spread, as the majority of the articles have a white background and a mixture of black and red fonts, this article has a black background and a mixture of red and white fonts. This is a very effective technique which helps to accentuate that this is one of the main articles in the magazine; therefore it has to stand out to the reader when they are flicking through and it certainly does this. The layout of the middle page spread is clever also as the left-hand page is all text and the right-hand page is one medium shot photo. Again ’50 Cent’ is pulling an intimidating pose which links in with the hip-hop genre, and the contrast of the photo has been altered so that it links in with the colour scheme of the article, which is predominantly black. ‘Hip-Hop Connection’ is at the forefront of the hip-hop music magazine industry and has had unprecedented success over the years, therefore it would make sense for me to use the design of this particular copy of the magazine to influence my own design. On the front cover the masthead text is of the largest font and I will definitely make sure that that is the case when it comes to the design of my magazine as it is very important for the reader to instantly recognise the brand and to be familiar with it. Furthermore, the rest of the text that is on the front cover is all of the same font type, with there being only a select few font types on the front cover as a whole. This I feel helps give the magazine a uniformity which makes it appear tidier and more professional on the whole, and again I will do the same thing when I come to designing my magazine. On the contents page instead of having multiple photos there is just one, large photo which helps to draw attention to the person in that photo and to highlight the article on that person in the magazine. This is an effective way of making sure the reader knows of and reads the main article and again I will use this technique in the design of my magazine as I think it is very successful in achieving its aims. On the double page spread there is a quotation that cuts through the rest of the text and acts as a lure to the reader, and as well as serving that purpose it also helps to break up the text and make the article appear to be more spaced out and makes it appear that there is less text which is aesthetically pleasing to the reader. Moreover, the title of the article is the largest font size of all and a different colour to the other text which adds to the importance of it and helps to make it stand out from the rest of the article. All of these simple but effective techniques have helped make ‘Hip-Hop Connection’ a massive brand and through analysing this design I will use the techniques highlighted above to try and make my magazine as professional looking and as high a quality as possible. I asked twenty people to fill out my questionnaire, all of whom were of my target audience. The first question was: ‘Do you read any Hip Hop magazines?’, and all twenty questioned answered saying they did, this shows that the results I have collected will be as useful as possible and will help me a great deal to produce the highest quality hip hop magazine. 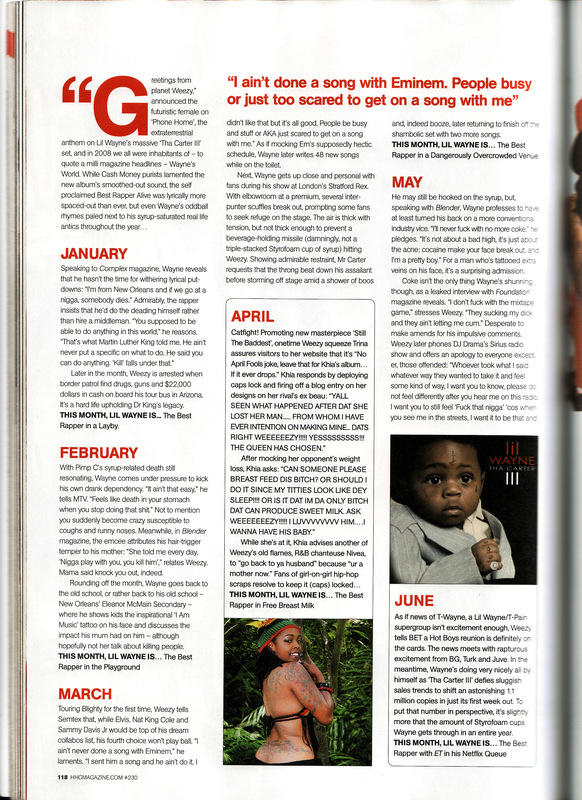 The second question asked how many hip hop magazines each person queried bought a month, with the majority saying four however, there was only 10% difference between this majority and the second highest result of three, so those two combined means that 70% of those questioned buy either three or four hip hop magazines a month. This shows that the results are very reliable and give me a very good chance of producing a good quality magazine of this genre. The third question, ‘How much would you be willing to pay for a hip hop magazine?’ came back with the majority saying £4, although again the difference between the majority and the second highest total which was £3 was only marginal with there again only being a 10% difference. So the magazine I am producing would ideally be around this price margin or if possible, lower than this, so that I can try and attract as many readers as possible. The fourth question related to the amount of times the magazine should be published, most said they would like it to be published weekly but there was only 15% difference between this and those wanting it to be published monthly. Based on these results I think I will publish my magazine monthly, although this goes against the majority I think that this will be the most cost effective way and allow me to produce a better quality magazine, as I will be able to include all of the major developments of that month which will be more interesting to the reader rather than a more frequent, lower quality magazine available weekly. The fifth question was to do with the content of the magazine and the format that those questioned would like to see, the possible answers were out of the majority of the article consisting of images, and even spread between images and text and finally the majority of the article being textual. The most popular option by far was the article format being an even mixture with 85% wanting this, and I will stick to this format as the overwhelming majority would like to see it like this and it is the best way to ensure that my magazine is successful and a perfectly sellable item. The sixth question was, ‘Would you like the main articles to feature established artists or up and coming artists?’, it was very close between the two options of established artists and up and coming artists with 55% wanting established artists and 45% wanting up and coming artists. As the results were so close I think that it would be fine to alternate between the two, so for example one month the main articles could be predominantly about already established artists and the next month could be predominantly about up and coming artists. This way I feel I satisfy the wants of those that have a bigger interest in the established, and also those who like to hear about the up and coming talent. This is sure to increase the chance of my magazine being bought and increase the appeal of it to my target audience. The seventh question: ‘What type of article would you like most in a magazine?’ came back with the majority saying they would prefer upcoming events to the other choices listed which were, interviews, exclusives and free CDs. However, all of these features will appear in my magazine this question was just to determine what my target audience are most interested in and to make sure that whatever it was they wanted, in this case upcoming events, is covered in detail in my magazine so that they are definitely getting the information they want. So based on the answer to this question I will definitely have detailed information about upcoming events, and I will also have the other choices included which were interviews, exclusives and free CDs. I think this will make my magazine more appealing to any potential buyers and increase the chances of them buying it. The eighth question was about who those questioned would like to see on the front cover. All the artists listed were established artists and there was also the option of writing any possible artists I could have on the cover, none of the people questioned used this and instead opted for an established artist. I think that it is necessary to have an established artist on the front cover to draw in potential readers as an up and coming artist would not provide the same level of appeal for readers and as a result, would mean that there is less chance of my magazine being bought. Therefore, I am going to have an established artist on my front cover, the most popular choice of established artists out of a list of: Lil Wayne, Jay Z, Kanye West and Eminem was Lil Wayne. The ninth question was about the colour scheme of the front cover, and what colour scheme they would like. The majority voted for black and red with a percentage of 58%, which was the biggest value by far. The other possibilities were black and yellow, blue and white, red and white and an option of those questioned own ideas of a good colour scheme. I am going to use the colour scheme that those questioned would most like to see which is as already stated red and black, I think this will help reinforce the masculinity of the magazine as appearing intimidating and macho comes hand in hand with the hip hop genre, and black and red are very manly colours. The final question was: ‘What font type would you prefer the masthead to be in?’. I then gave a list of five different fonts, with all of them fitting in with the hip hop genre, so they are therefore quite bold and the majority are serif fonts. The third font listed was the most popular with 50% saying they would prefer this to the others, no other font listed came close to this outcome so I think that this font will be the most effective and am definitely going to use it, the font was ‘impact’.Overall the results to my questionnaire have been very helpful to me and in the planning for my hip hop magazine. The results I accumulated have influenced my choices and helped me to realise what it is people interested in my genre and of my target audience would like, and I am therefore going to base my magazine around their preferences. For any magazine it is imperative that the choice of pictures used can instantly be associated with the genre of that magazine and to make sure that they entice the reader into purchasing it. Therefore it is of the utmost importance that I get my photo-shoot right so that I have the highest quality photos that will succeed in luring my target audience. The norm for hip-hop related photos is for the person/persons in the photo to appear intimidating, masculine and aggressive, consequently this is the mood that I will try and convey to any potential readers with my photos. The first thing I did was to organise the model I would use for my photo-shoot. To do this I used the instant online messaging service MSN, on there I asked my friend to pose for my photos and sorted out with him where and when I would meet him and what he would need to wear. After I had the model organised for my photo-shoot I could begin planning it. I came to the decision that for the lighting of the photo-shoot I would use artificial lighting, this is because I feel with artificial lighting you can control the light direction, where the shadows fall as etc. and this way you can make sure the photos are exactly the way you want them to be, with this in turn improving my chances of getting high quality results and giving the pictures a more professional look. In any photo the clothing and props of the model is essential and this is no different with mine. When I arranged with my model to feature in my photo-shoot over MSN I told him what I wanted him to wear, with this being urban clothes such as tracksuits, jackets with hoods etc. For props I asked him to wear sunglasses as this adds to the shady, tough, intimidating look that goes hand in hand with the hip-hop genre. Finally the last thing I needed to think about for the planning of the photo-shoot was the location of it as this contributes vast amounts to the overall quality of the photos. I am going to get my model to pose in the street as the name of my magazine is ‘Streets & Beats’ and the hip-hop genre is based around street life in urban areas, and I feel this is the best possible setting for a photo-shoot of this genre as it helps to further link in with the hip-hop subculture and helps to connect with my target audience. With this planning I am sure I can take the best possible quality photos which will add a lot to the effectiveness of my magazine as a whole. This entry was posted on September 23, 2009 at 3:00 pm and is filed under Uncategorized. You can follow any responses to this entry through the RSS 2.0 feed. You can leave a response, or trackback from your own site.